Safety first. Be wary of using any tools or appliances that could cause sparks, heat or flame when working around or near fuel. Use eye protection when working underneath truck. Be sure the ignition is off and secure vehicle from rolling while working on, in or around the vehicle. Do not attempt to start or run engine while someone is near the engine compartment or under vehicle. Fuel tank should be empty before removal. Handle fuel in accordance with all regulations. Disconnect the filler neck tubes from the rubber hoses coming from tank. Place blocks or some means of support under tank on each end and remove tank straps. 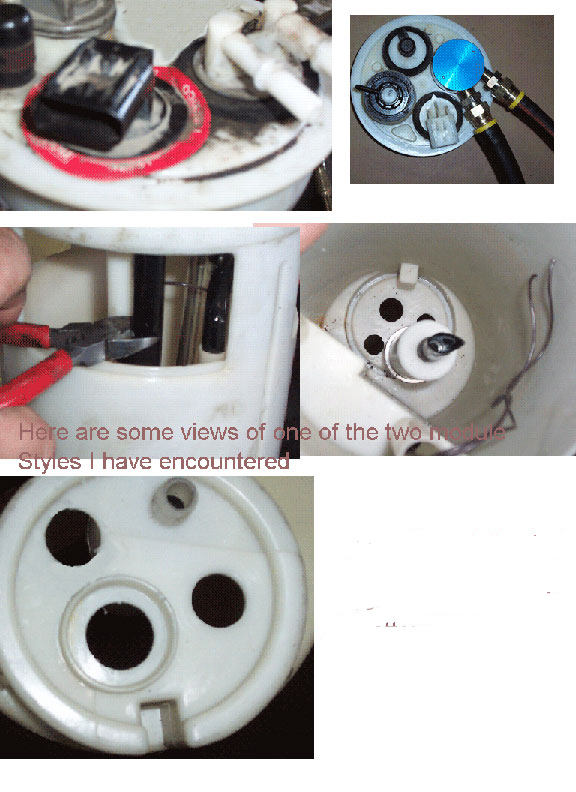 Lower tank and remove the electrical harness, fuel supply and return lines from top of tank. Clean off the top of tank around the area of the tank module and the top of the module itself so contaminants to not get inside the tank. Mark the position of the module on the tank so it can be replaced in the same position. Remove the module by unscrewing the plastic ring. These can be difficult and may require the use a hammer and block of wood to knock the ring loose and possibly two persons doing this from either side. Be careful not to hit too hard as it is plastic and could crack. Once removed pull the module out of the tank and drain any fuel into a container. Clip the supply and return tube. Remove the fuel supply/return fitting from the module. You can pry up on the edges and pull put from the rubber grommet, clip the line that was formerly the draw tube with a pair of cutters (see pictures). Split the module halves (upper and lower), some units have screws and some snap off. Remove filter screen unit from the bottom of module. On some units this is done from the inside by pulling out the old draw tube then removing the screen, on others remove the screen from the bottom. Only the top screen is to be removed permanently. Cut out the top screen but leave the plastic ring in place. 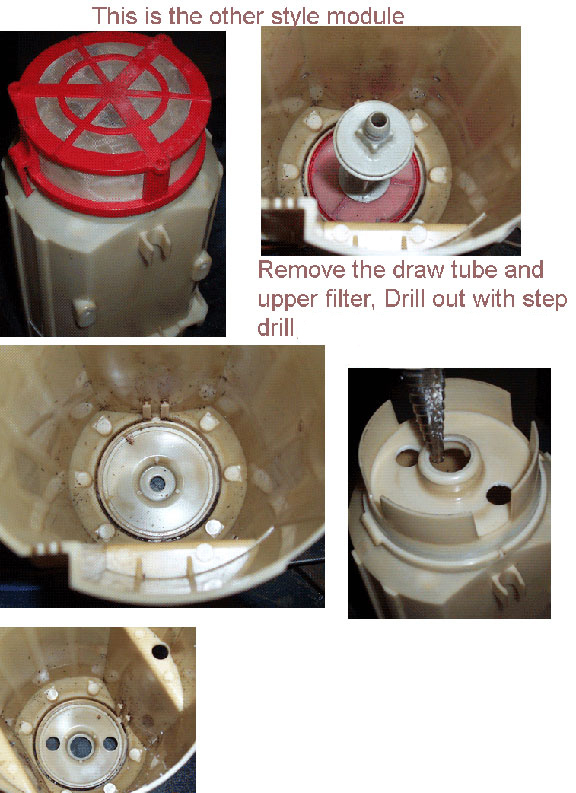 Using a step drill, drill a hole in the bottom of the module so the draw tube can go down inside the filter area, drill additional holes on either side for return flow. Drill three 3/8" holes around the circumference of the module about 3 in. from the bottom of the module. Clean out any chips from the drilling and be sure the screen is clean and in good shape. Place the module back in the tank, remove the rubber grommet and place the Draw Straw TM unit into the module and measure how much length to trim off the tube, cut the new draw tube at an angle so it will have unobstructed suction. Tube should be at the bottom. Install the fittings of your choice into the Draw Straw1 fitting and tighten. Use diesel compatible sealant on pipe threads as needed. Be careful not to run your tank too low after performing this modification. Attach your fuel supply line to the outlet fitting and your return line to the return fitting. Move tank into position and elevate using supports and reconnect the wire harness. Be sure the filler hoses are clear over the frame, raise tank, support and reinstall the tank straps. Reconnect supply and return connections. Place fuel in tank, prime, start and check for leaks. If a leak is discovered shut off engine locate and repair before proceeding. Use of an inline external pre-screen filter is recommended. Use of hose clamps with push lock type fittings may cause damage to hose.